At first glance, it appears that this would avoid the “problem” of pitting a president/vice-president team against each other in a run off in the House—but would not really change much else. We reject this argument as specious. Let us go through the amendment step by step and analyze it to show how the functions of the original system were obliterated by this amendment. The reason for meeting separately in their states was to avoid excessive pressure and outside influences on the Electors to vote a certain way (predetermined decisions). We can see that by this time the process had been totally turned over to the outside influence of political parties and was all about predetermined decisions. This constitutional check now accomplishes absolutely nothing. The separate vote for presidential and vice-presidential candidates would only serve to get regional or other specific support for the party ticket rather than to select the best candidates for either office. 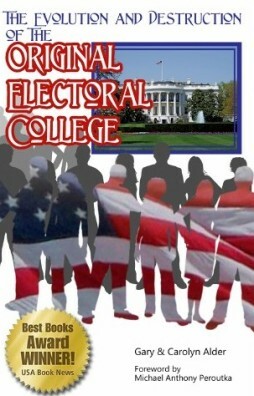 The reason that the original system restricted each Elector to a maximum of one individual from their own state, was to avoid local bias and to get each Elector to look outside of his state for patriots—not to restrict naming potential presidential candidates from the same state (see page 27). The Framers considered a vote for a man of an Elector’s own state as a vote “thrown away”. The process was now changed to where no real field of candidates for president was being made by the Electors. In fact, with one of each Elector’s votes going to a vice-presidential candidate, the number of possible presidential candidates was cut in half. As far as nominations for president, the votes for vice-president were now “thrown away”. There is no reason to have such a meaningless statement in the text of the Amendment. It appears to be there only to give the impression to the casual reader that nothing has changed much from the original design where a similar statement had purpose. This is just procedural, implementing the changes in concept. If we allow the possibility that the choice made by some Electors for President might be the choice of other Electors for Vice-President, this change drastically diminishes the odds of achieving a majority of electoral votes for either office—unless the Electors are mere pawns of the political parties. The words are the same; the significance is gone. Instead of this counting of votes being the means of reducing the number of nominees to five or less candidates (Phase 2), this is now just a formality. The parties have already picked their candidates. This amendment effectively changed the Electors’ function from nomination (Phase 1) to final vote (Phase 3) by using them to attempt to force the shortcut in candidate selection (Phase 2). This places the Electors in the position of being used as pawns to party machinations. Just think what it would do to the outcome if an Elector decided to reverse his vote for President and Vice-President just because he thought the individuals would do better in those respective roles. In order to achieve the goal of having the Electors choose the President and Vice-President, more collusion and manipulation would be required. b) Over half of the Electors must have nominated that individual. The required majority to bypass the vote of the House was a majority of the number of Electors, not electoral votes. Since each Elector cast two votes, a candidate would need just over 25% of all electoral votes cast. With the ratification of the 12th Amendment, it was impossible for two candidates to be tied with a majority of electoral votes because each Elector only casts one vote for President. While this solved the tie part of the “problem”, obtaining the required majority became infinitely more difficult without abandoning the principle of independent Electors. For the shortcut to apply, a candidate would need over 50% of all electoral votes for President instead of over 25% of all electoral votes cast. This is the problem caused by the 12th Amendment “solution”. In theory, the Electors could act independently; but if a large number did so, the majority needed to bypass the vote in the House could not be achieved. In a vote by independent Electors, the election would always go to the House. The way to get around this would be manipulation of the Electors by the parties. The net effect of the 12th Amendment was to solidify party control of the nomination process. and if no person have such majority, then from the persons having the highest numbers not exceeding three on the list of those voted for as President, the House of Representatives shall choose immediately, by ballot, the President. But in choosing the President, the votes shall be taken by states, the representation from each state having one vote; a quorum for this purpose shall consist of a member or members from two-thirds of the states, and a majority of all the states shall be necessary to a choice. Obviously the parties do not want the election for President to go to the House because parties work on the popular election concept. If the election goes to the House, the number of candidates for President is restricted to no more than three. This is of little consequence if the parties own the members of the House of Representatives. The party that controls the delegations from a majority of the states will prevail. This refers to the Vice-President elect as described next. The number of candidates for vice-president is restricted to two. The party with the most Senators wins unless you assume that some Senators will vote their conscience rather than follow their party affiliation (which option is becoming more and more remote).